This article is about the system to customize assets since 1.6.1. For the system used before 1.6.1, see Texture pack. The default textures, with a custom resource pack (DokuCraft) in the center. The resource pack system is an API which provides a way for players to further customize their Minecraft experience. Resource packs allow players to customize textures, models, music, sounds, language files, end credits, splashes, and fonts without any code modification. The resource pack selection menu, with Ninety-Six on top, followed by Favorite Songs Pack, then the default assets. Resource packs can be placed in the folder resourcepacks within the .minecraft folder. Each resource pack is either a sub-folder or a .zip file within the resourcepacks folder. After it is in the folder, a resource pack can be added from the options menu, where resource packs can be moved between "Available resource packs" and "Selected resource packs". "Selected resource packs" will also contain the default assets on the bottom, which cannot be removed. Resource packs will load their assets based on the order of the packs on the list. The bottom most pack (which is always "Default") will load first, then each pack placed above it will replace assets of the same name with its assets. A resource pack can be bundled with a map by saving it under the name resources and placing it directly in the map's folder. Note that the resource pack must be a .zip file. When playing the world, that resource pack will appear as the default right above the default resource pack. In Console Edition, mash-up packs (which are the equivalent of resource packs) are available as downloadable content that can be bought from the Xbox marketplace/Playstation store/Nintendo eShop or from the downloadable content section of the game. Mash-up packs also come with a skin pack and a themed world. Similarly to skins, resource packs can be bought or made in the Pocket Edition. Plastic, City, and Natural texture packs (ported from the Console Edition) are available to buy currently. To install custom texture packs, the player must create a resource_packs folder in their com.mojang folder and place resource packs here. Note that, due to limitations, iOS users must use an external file viewer program like iExplorer or iFunBox (Windows and Mac) in order to place custom textures, as iTunes file sharing does not allow you to navigate into folders. Android users can do this straight from their device. As of 0.16.0 iOS users can download resource packs on the system itself with the .mcpack and .mcworld file names. A resource pack is identified by Minecraft based on the presence of the file pack.mcmeta in the root directory, which contains data in JSON format. pack_format: Pack version. If this number does not match the current required number, the resource pack will display an error and required additional confirmation to load the pack. Requires 1 in versions before 1.9, and 2 as of 1.9 and 1.10. 1.11 also requires a new number, 3 .
description: Text that will be shown below the pack name in the resource pack menu. The text will be shown on two lines, and if too long extra text will be cut off. bidirectional: If true, the language reads right to left. The root directory also contains an optional image called pack.png, which will show as the thumbnail for the pack on the resource pack selection menu. Resource packs can create language files of the type .lang in the folder assets/minecraft/lang. Each file will either replace information from a file of the same name in the default or a lower pack, or it will create a new language as defined by pack.mcmeta. Each line in the language file is in the format of identifier=name. identifier is the name that the game looks for to determine the name for something, and as such it should not be changed. name is the name that is displayed, which takes any text after the equals sign up to the end of the line. For example, stone in the default language file is tile.stone.stone.name=Stone, with tile.stone.stone.name being the identifier, and Stone being the displayed name. Blank lines and lines starting with # are ignored. Language files only need to add lines that are actually changed by the pack, any names that are not in the pack will be loaded from the pack below, or default if no pack changes the names. Models are files in JSON format with the extension .json, which determine the shape and textures of blocks and items. Blocks use a block state file from assets/minecraft/blockstates to determine which model is loaded for each variant from the folder assets/minecraft/models/block. Meanwhile, each item has an item model in assets/minecraft/models/item to determine its model, which either loads from a block's model, contains data for its own custom model, or uses the default "flat" or "entity" model. Models and block states used in packs below the top one will still be loaded unless overridden in the top pack, which may cause some textures and models used by the top pack to no longer be loaded. Resource packs load additional sounds with the file type of .ogg. Each sound placed in the pack will override the sounds from packs below, and packs also contain a file called sounds.json which is placed within assets/minecraft. Unlike most other files in resource packs, sounds.json will merge sound information from packs below the top pack, rather than each sounds.json file overriding the previous completely. The "missing texture" for invalid or missing textures. For block or item textures to function, they must have equal width and height (or height that is a multiple of the width if animated); otherwise it will display as a purple and black checkerboard. For most other textures, the file will simply be stretched to fit the required dimensions. Most solid blocks will turn any transparent area fully opaque. Some other blocks, which have "cutout" transparency (like glass) will turn all pixels that are less than 10% opaque fully transparent and all other pixels completely opaque. Every other block renders textures with semi-transparency as-is. All items and any blocks or entities which are semi-transparent by default support semi-transparency. If a file does not exist in any resource pack, including the default, it will display as a purple and black checkerboard. Block and item textures support animation by placing each additional frame below the last. The animation is then controlled using a .mcmeta file in JSON format with the same name in the same directory. For example, the .mcmeta file for stone.png would be stone.png.mcmeta. interpolate: If true, Minecraft will generate additional frames between frames with a frame time greater than 1 between them. Defaults to false. width: The width of the tile, as a direct ratio rather than in pixels. This is unused in vanilla but can be used by mods to have frames that are not perfect squares. height: The height of the tile in direct pixels, as a ratio rather than in pixels. This is unused in vanilla but can be used by mods to have frames that are not perfect squares. frametime: Sets the default time for each frame in increments of one game tick. Defaults to 1.
frames: Contains a list of frames. Defaults to displaying all the frames from top to bottom. time: The time in ticks to show this frame, overriding "frametime" above. If the .mcmeta file does not exist in the pack and the texture does, the game will assume the texture is not animated, rather than loading a .mcmeta file from a pack below that pack. If no .mcmeta file exists for a texture with unequal dimensions, the texture will appear as a purple and black checkerboard. Colormaps are 256×256 pixel images which tell the game which color to use in each biome. They are located in assets/minecraft/textures/colormap. The game contains two colormaps, foliage.png which colors plants such as leaves (except birch and spruce) and vines, and grass.png which colors grass and grass blocks. Colormaps can be disabled on individual blocks by removing the tintindex tag. Font files contain a grid of white characters, which are automatically colored by Minecraft as needed in game. The character sizes are automatically determined based on the last line of pixels containing any alpha value. Due to the way fonts are detected, filling the background of a character with a color containing a 1% alpha background will cause the full width to render without having a visible background to the character. If the .mcmeta file does not exist in the pack and the texture does, the game will load the default settings, rather than loading a .mcmeta file from a pack below that pack. Three .txt files in UTF-8 format exist in assets/minecraft/texts which are used by the game to determine the text to display. The file end.txt contains the text of the end poem, using formatting codes to apply the colors to the two speakers, and with the text PLAYERNAME being replaced with the player's name. After that file is shown, the contents of credits.txt will be shown. The file splashes.txt contains lines of text separated using line breaks to determine the splashes to display in game. Any of the splashes can be replaced with different text, which will then be used in place of that splash in game. dig - Sounds used for destroying blocks. step - Sounds used when the player steps on certain blocks. Note: This video is outdated, as servers now fully support resource packs. Added resource packs, replacing the functionality of texture packs. Minecraft Texture Ender is available from Mojang to automatically convert 1.5 compatible texture packs to resource packs. Fixed distorted font when HD font is used. Added the ability to apply multiple resource packs at once. Moved files from assets/minecraft/music to assets/minecraft/sounds/music and files from assets/minecraft/sound to assets/minecraft/sounds. Removed the ability to change Mojang logo. Added the ability to change the block models. Resource packs can now be bundled with a map. The model format now supports custom item models. 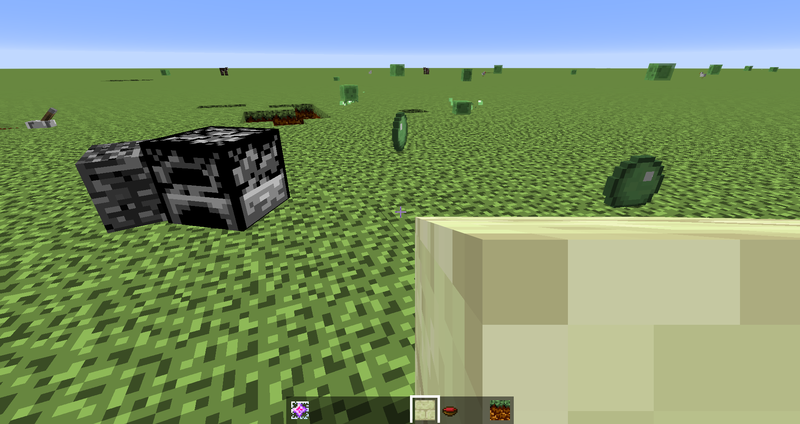 Textures can now be specified for blocks and items. Added the interpolate tag for animations. Resource packs now display an error if the pack version number is wrong. At this time, it requires a pack version number of 1. Resource packs version number was changed to 2, due to changes in the model system, such as item tags, multipart, and changes to display tags. Using resource packs with outdated display tags will cause the models to seem abnormally up-scaled and the wielded block will not be rotated in the hand, along with blocks in the inventory replaced with a 2D texture. This is similar to what happens when a model has no display tags. See here for an example. Resource packs version number changed to 3, due to the change that all files should have lowercase letters. Added resource packs Plastic and City.